All public transportation will be silenced, all restaurants will remain closed in Jerusalem this next Saturday evening as the sun sets. The Hebrew day of great tragedies, Tisha b'Av, will begin at sundown July 28. In remembrance of the destruction of both the First and Second Temple on the 9th of Av hundreds of years apart, tens of thousands of Jews will gather at the Western Wall to pray and petition the God of Abraham, Isaac, and Israel. Jewish hearts around the world will long in unison for the future Temple, the one to be established when the Messiah comes. The Women in Green will honor Tisha b'Av by holding its 18th annual walk around the perimeter of the Old City, a demonstration of Israel's sovereignty over Jerusalem. The walk will begin with the reading of the Book of Lamentations, customary as Israel mourns for the Temple. The organization Women for Israel's Tomorrow is known better as Women in Green after their habit of wearing green hats. It is "dedicated to the security and Jewish heritage of historic Israel." The organization supports settlement of Israel's territories and opposes a two-state solution in the spirit of supporting the possession of historic Israel as a home for the Jewish people. This week, Jews look toward the Temple Mount with even more longing than normal. Israel has technically controlled the Temple Mount since the Six-Day War in 1967, but the Waqf, a Muslim council, manages the site. The Temple Mount is noticeably dominated by the al-Aqsa Mosque and the Dome of the Rock. Israeli law is supposed to protect free access to the site, but the Israeli government enforces a ban on any non-Muslim prayer on the site in order to avoid Muslim riots. Many Jews look forward to the day when the Messiah will come, when the Temple will once again rise up on the Temple Mount. A video by The Temple Institute shows a little boy and girl playing on the beach and building a replica of the Temple in the sand. The end caption reads, "The Children Are Ready." The video had 110,000 views on YouTube by Tuesday, five days after its release. Rabbi Chaim Richman of the Temple Institute stated, "This Tisha B'Av we want people to do some serious soul searching and truly contemplate what they are missing without the Beit Hamikdash. We are delighted at the outpouring of well wishes and positive response we have received and urge all of Am Yisrael to watch and share the video." While many patiently anticipate the coming Temple, not all Jews want worshipers, Jewish or Muslim, flooding the Temple Mount. Nobody is certain exactly where the Holy of Holies in the Temple was located, and these faithful Jews do not want the unwitting visitor to tread on that spot. Worshipers must first be cleansed with the ashes of the red heifer as required in Numbers 19 before Jews can worship freely in the Temple area. East Jerusalem and the Temple Mount have been points of major contention in past efforts to negotiate a two-state agreement. 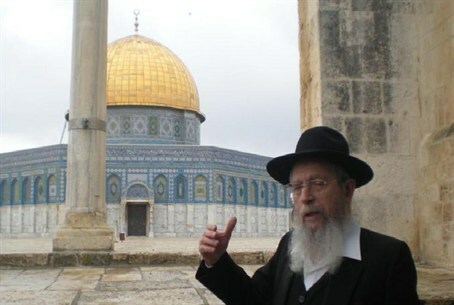 The Palestinians want East Jerusalem, and the Jews do not want to give up this location that is so precious to Judaism. The world would never expect the Muslims to hand over control of the Kaaba in Mecca in order to keep peace, but the Jews are not free to worship on their holiest site because they fear Muslim violence. Tisha b'Av is Hebrew for the 9th day of the month of Av, and it completes the Three Weeks of mourning that began with the Fast of Tammuz on July 7th. AD 136, the Roman Emperor Hadrian established a heathen temple to Jupiter on the site of the Jewish Temple. Hadrian rebuilt Jerusalem as a pagan city, and renamed the land as Palestina, to distance its Jewish heritage. The date when the Temple area was plowed under by the Romans was the 9th of Av. The day has continued to be associated with grief for the Jewish people throughout history. For example, Pope Urban II declared the Crusades on the 9th of Av in 1242. According to the Alhambra Decree, the Jews were expelled from Spain in 1492 on this day (the same day that Columbus left on his westward route to the Indies). On the 9th of Av in 1942, the Jews in the Warsaw Ghetto were mass deported to the Treblinka extermination camp in Poland. Thus the 9th of Av, Tisha B'Av, has become a symbol of all the persecutions and misfortunes of the Jewish people, for the loss of their national independence and their sufferings in exile. Above all, it is a day of intense mourning for the destruction of the Temple. Tisha b'Av is marked with sadness and fasting from food and drink. Observant Jews avoid bathing or washing clothes or enjoying entertainment like music or movies. On this day the Jews are reminded of their tragic history. Yet, this day is also expressly linked with Israel's glorious destiny. The Jews also look forward to the ultimate rebuilding of the Temple, to a time when Tisha b'Av will become a day of joy and gladness (as it was foretold in Zechariah 8:19). We do know that the Temple will be rebuilt because Jesus, John, and Paul all make reference to it (Matt 24:15; Rev 11:1, 2; 2 Thess 2:4). We also know that a future Temple will be desecrated by the Coming World Leader when he sets himself up to be worshiped (2 Thess 2:3-4). It is possible this prophetic event will also take place on Tisha b'Av—and may happen in the not-too-distant future.